Snälleröd Distillery can trace its origins back to an early 20th century farm. The history of the brand as a Snaps and Aquavit distiller goes back to 1991 when Eric Berntson began producing products under the brand. Brännmästarens Akvavit— similar to Linie Aquavit— is distilled by Arcus— but sold under the Snälleröd brand. 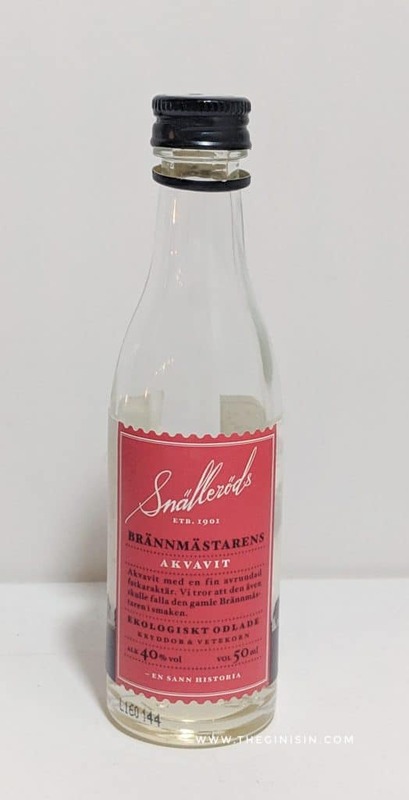 Literally, Brännmästarens Akvavit is the fireman’s favorite in the Snälleröd product line. It features cumin, anise and is aged in barrels formerly used to hold Sherry. Brännmästarens Akvavit is rather anise forward on the nose. Sweet star anise, chewy licorice, a hint of vanilla and chardonnay wine all give this Aquavit a rather unique and surprising nose. The palate is creamy and unctuous. Vanilla kissed caraway seeds, a honeyed, gentle barrel note gives Brännmästarens Akvavit has a young aged gin like creaminess. It’s less caraway-forward than other Aquavits with the botanical blend suggesting bitter orange zest and mallow root. The finish is short and moderately sweet. Vanilla, a hint of honey and a hint of cumin seed— raw, before being toasted or ground, with just a hint of that white wine barrel again on the finish. Brännmästarens Akvavit is quite lovely and accessible. If you’re unfamiliar with Aquavit or shy about the style— Brännmästarens Akvavit is a great entry point. The traditional aquavit botanicals are nicely balanced with each other and other botanicals. If you like lightly aged gins, this might be a good Aquavit to get you started. It’s far less emphatic in terms of the Sherry than was Linie or gins that used those sort of barrels also. Fans of Aquavits though may find it a bit too mild and too subtle. The anise forward perspective, as well as some of the barrel notes make Brännmästarens Akvavit slightly less traditional. But it’s well made nonetheless.